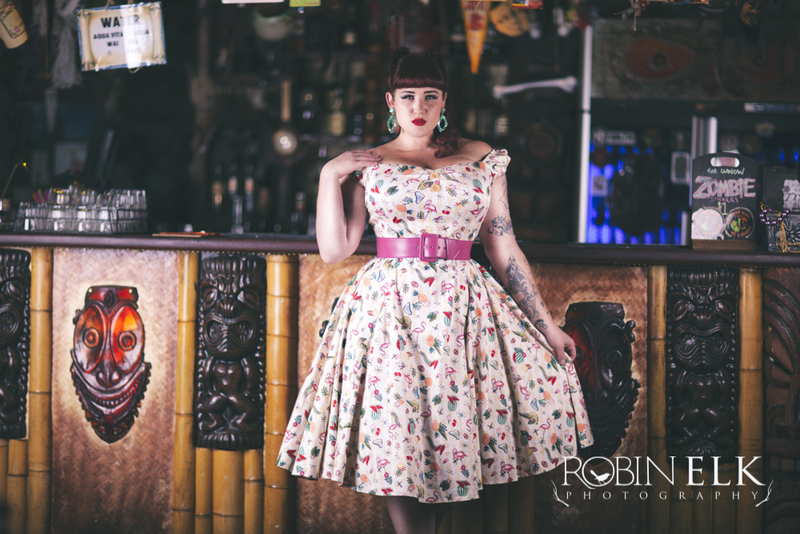 I've been in love with the true vintage inspired designs of Collectif for years and they have always popped up in my reviews and shoots here on my blog. I love both the fit of their garments and the truly figure flattering items they make for girls with curves. So a few weeks back I had a chance to shoot some of my stand out favourite items! This was the last set we shot at Melbourne's own LuWow! I seriously can't get enough of this place and can't wait to get back inside. This is my second Dolores dress and I love, love, love this style! 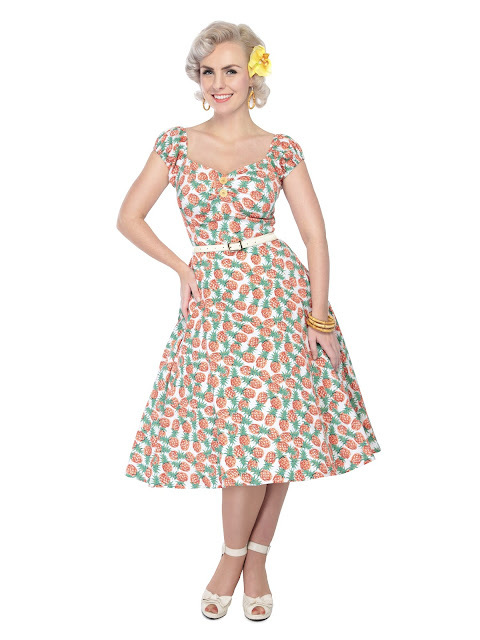 Such a super comfortable, hourglass flattering and stunningly printed dress that I'm smitten with. My previous Dolores dress was the plain black fabric but this time I wanted to bold and fun print. The Atomic Flamingo print is amazing and so detailed. Full of everything tikitastic such as fruit, starbursts and flamingos. How perfect does this dress pair with my location? Size wise I found that this style was a lot larger than my other 16UK. While they are the same size this dress was a much looser and roomier fit. To the point where I could have used a size 12 and had a more suitable fit. The waist belt helped with nipping in that roomy waist but I will need to purchase a 12 in the future Dolores's dresses. So if you usually fit into a 16UK in this specific style I highly recommend you size down 2 sizes to get a more fitted and vavavoomy fit. 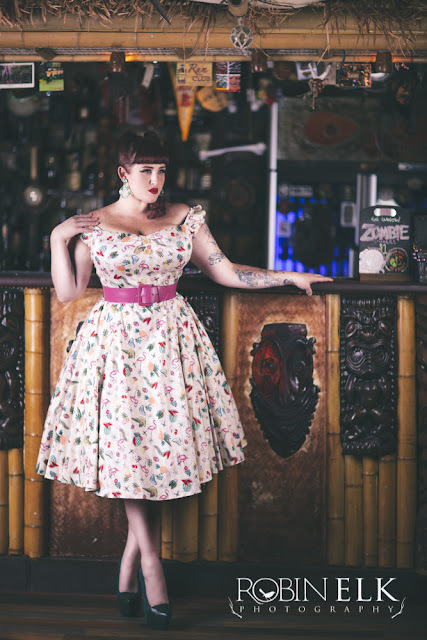 Now this print is in stock from size 6 to 18 and I think this is going to be the print I need this summer! If the Dolores is not the style your after there are even more items available in store if you click here. You can get a pencil dress, Dolores top, gypsy top and more! Oh, this print will send me broke, I tell you. After years of wearing Collectif cardigans I've opted for a knitted top this time as it's super chilly down here in Melbourne and I'm always looking for tops that both flatter my shape and have higher necklines. The Stefania Cherry Scarf knitted top is so cute and I love the soft and stretchy fabric. This is no ordinary jumper and the combination bold red colour and adorable built in scarf detailing really makes this item pop. I paired this with my Mini Liesel Check print skirt from last winter as I love the bold check print paired with red. I'm wearing this style in a 16UK (sadly they only have 20's left for the moment) and it's a figure hugging and comfortable fit. But if you are going to wear this to work you will need to wear a singlet underneath as it becomes a little sheer once stretched. My tattoos pop through on the upper half of my arm and my bra was a little visible at times. The Stefania top also comes in black with a white and black polka dot scarf and if this style returns I'll be buying it and any other colour ways that might come out. I must have taken way too much time to shoot these amazing items because everyone snapped up most of the sizes and I don't blame them. I missed out on this BRILLIANT bowling bag when it was first released but on the second release I jumped straight onto it! The main thing I have to say about this retroluscious handbag is that if you think it's stunning in this image you will not believe your eyes when you see it in person. 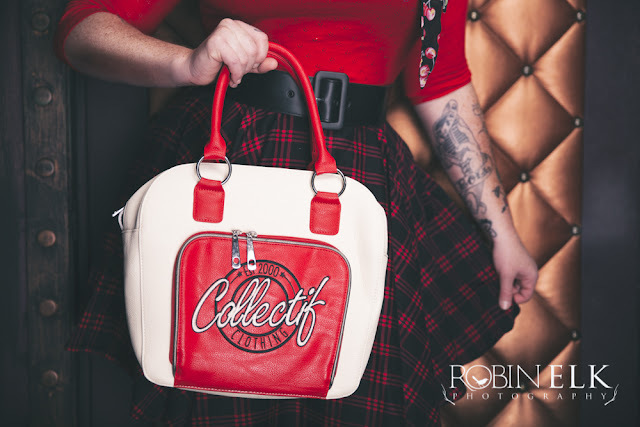 Made from super high quality matte faux leather and embroidered with the Collectif logo this is the perfect purse to pair with all your pinup outfits. I reviewed one more item but the images won't be released until the next issue of Adore Pinup so watch closely for a more winter themed amazing skirt review. Many thanks to the brilliant Michael of Robin Elk Photography for working on these images with me in the most perfect location possible. I can't wait to share more of the magic we've been creating together.